Family Law and Public Policy Class Explores Ways To Enact Policy, Experiences D.C.
Four Samford University students taking the Family Law and Public Policy class during summer session had the opportunity to see and experience what that looks like in the real world. 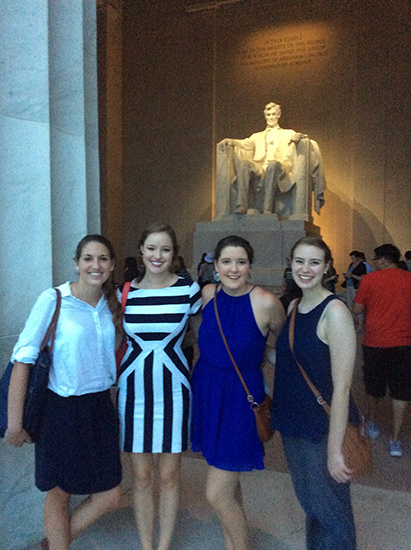 The group recently returned from spending a week full of meetings and tours in Washington D.C. The group was a part of department chair Kristie Chandler’s class in Samford’s human development and family science major. Chandler organized the trip in hopes that her students would be able to see family law and public policy in action. "Going into the trip, I wasn't quite sure what to expect and did not know exactly what our meetings would be like, said Kate Wildman, a junior from Decatur, Georgia. "However, I am happy to say that I learned far more than I thought I would and really did enjoy every moment." A theme naturally arose from class meetings, and the group spent a great deal of time learning and discussing the specifics of some issues that arise from belonging to a military family. This trip also served as an opportunity for Samford to build its reputation in this field, to spread awareness regarding the department’s expertise and begin developing relationships that could lead to future internship or employment opportunities for students, Chandler noted. The trip included meetings with representatives from the Administration for Children and Families, Head Start, Office of Child Support Enforcement, Office of Child Abuse and Neglect, Office of Family Assistance, Society for Research in Child Development, Georgetown University, the Pentagon and Congress, including Rep. Gary Palmer from Alabama’s 6th district. The group also had a chance to take in some of the history and culture that surrounds the nation’s capital. Those included trips to the Supreme Court, Library of Congress, the Capitol building and various other memorials. Dr. Chandler hopes to take another group of students on a similar trip in the summer of 2017.